Most Exeter residents have fond memories of shopping in the downtown at Christmastime and the fun that takes place as the season kicks off. Since the 1890s, when local merchants began actively advertising gift items, the town has decorated and encouraged people to join in the festivities. After 1916, when the bandstand was constructed it became the focal point of the downtown. Easily decorated to accommodate the season, the bandstand was the obvious place to hold Christmas events. Annually, there would be a discussion of whether to erect a tree and who would pay for decorations. A considerable amount of money was sunk into the lights just after World War II. It seems that people in town were eager to put blackouts and wartime austerity behind them. In 1948, Exeter joined many communities in the United States by holding a parade. The ‘Santa Claus Parade’ was sponsored by local merchants and the Exeter Chamber of Commerce. Snaking around the downtown, the parade featured local school bands, the fire department, fraternal organizations like the Improved Order of Red Men – who marched in full regalia – and church groups, including St. Michaels’ CYO. The Kiwanis Club float carried the Exeter High School and Robinson Seminary glee clubs. At the end of the parade, on a huge flatbed truck with an igloo affixed, was Santa Claus himself. Parades dedicated to the Christmas shopping season had been around for decades before Exeter joined the party. The granddaddy of them all was not the Macy’s parade in New York, but the Toronto Santa Claus parade, which first stepped out in 1905 and is still held today. In Canada the season starts earlier than in the United States. Canadian Thanksgiving is celebrated on the second Monday in October and Christmas is fair game after that. Here in the US we expend a considerable amount of whining about how the holiday starts earlier and earlier every year even though a careful study of newspaper accounts for the previous 100 years indicates that we’ve pretty much stuck to kicking things off around the end of November. Although the 1948 Exeter parade was held on December 10th, in 1973 it swung through the downtown on November 24. Today the parade committee keeps it on the first Saturday of December. The Santa Claus parade marched for two years: 1948 and 1949. “The parade drew laughs, applause and shrieks of joy from the kiddies as their traditional Christmas hero, rode through snowless streets on a white truck on which was a white reindeer, Santa in his sleigh, and a white igloo,” wrote the Exeter News-Letter. Who knew Santa lived in an igloo? The following year, however, parade Grand Marshal, Lyman Collishaw, had to admit that the post-war economy was tougher than expected. He wrote, in a letter to the editor of the Exeter News-Letter, “These parades in the past were paid for by businessmen and civic-minded citizens. This year we did not have the courage to again solicit for this feature.” The Chamber of Commerce arranged for the triumphant arrival of Santa, but had a more subdued tree-lighting ceremony instead of a parade. The full parade returned in 1957 as the ‘Exeter Christmas Parade’ when, we can suppose, the economy made an uptick. Unhappily, the 1959 parade was rained out and most of the bands set to perform were unable to make the rescheduled event. They didn’t even attempt to have a parade in 1960, although Santa arrived for public appearances. Throughout most of the 1960s there is little mention of the parade. Either it wasn’t held or wasn’t promoted well. But in the 1970s it returned as an annual event. Part of the charm for over 20 years was the participation of Francis Wentworth –owner and founder of Wentworth Lumber Company. Wentworth was a driving force behind the parade and participated every year. He may have been hard to spot, unless you were looking carefully. Children know the real Santa Claus is in our parade, but for 20 years he looked just a bit like Francis Wentworth. In 1993, Wentworth was pronounced “Citizen of the Year” by the Chamber of Commerce and somehow managed to be in the parade twice – leading it off as Grand Marshall, and managing to bring up the end as, well, you know who. In 1994 the parade changed its marching time to evening, making Exeter’s parade one of the few held in the dark. The lights of the floats and the fireworks that followed for many years brought out larger crowds. Even the marching bands get into the fun by placing twinkling lights on their instruments and music holders. Today it’s called the Exeter Holiday Parade to broaden the appeal to all citizens, but there are no restrictions on what type of cheer the participants extend. Church groups march alongside Scout Troops. Both religious and secular seem to coexist happily and that, after all, is a good reason to hold a parade. Photo:The Exeter High School and Robinson Seminary Band march up Water Street in the 1948 Santa Claus Parade. 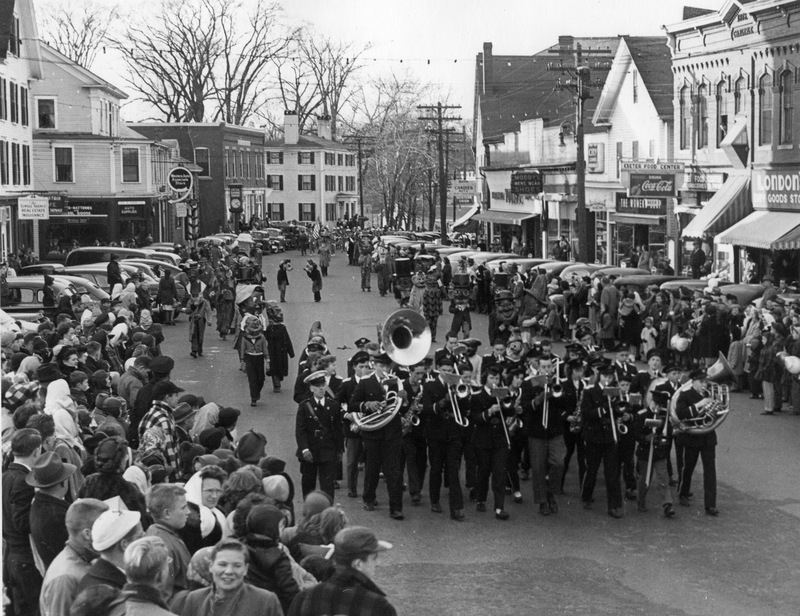 Parades have been a popular kick-off to the holiday shopping season in Exeter since 1947. One feature that has always been involved – the arrival of Santa Claus at the end of the parade.